You are at:Home»Ireland»Ireland U20»Ireland U20: Who did what 2018? Ireland U20s ahead of their game against Georgia in Narbonne. 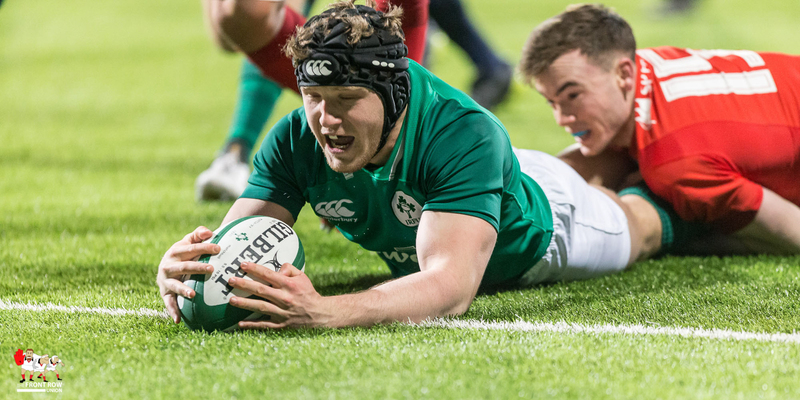 We continue to benchmark the season just gone with a look at the performance of Ireland U20’s in the Six Nations and the 2018 World Rugby Championship. Results wise it wasn’t the best of seasons for Ireland U20’s. Their two wins in the Six Nations (against Italy and Scotland) were followed by a single win (against Japan) in the 2018 World Rugby U20 Championship as Ireland slumped to an 11th place finish, their lowest ever. You can view our match reports (and match galleries) below. Ireland are shocked as Tedo Abzhandadze inspired Georgia to a 24-20 victory over Ireland a match day three of the World Rugby U20 Championship 2018. That leaves Ireland fighting for 9th place in the knock out stage. A tentative start from Ireland was punished when Arsen Machaladze crossed to give the Georgians a 7-0 lead. A summary of their results is shown below. As we said in our Six Nations Wrap it was always going to be a rebuilding year as the new coaching ticket of Noel McNamara and Paul O’Connor found their feet but having said that it was still disappointing. There were some good individual performances but the inability to grind out a win was worrying. We were not over concerned by their Six Nations performance at the time. In fact we had remained resolutely positive throughout until they shipped five tries in a second haf capitulation to England in their final game. Up until then they looked like a good attacking team, averaging four tries per game, but they did have issues with their concentration in defence as they shipped an average of five tries with all games having periods where they just appeared to switch off. Unfortunately this pattern continued in the World Championship. A promising first half performance against eventual champions France, where they led 17 – 5 at the break, ended with a 26 – 24 defeat. That match could have went either way but it was followed by a substantial defeat to South Africa. In this one they trailed 12 – 10 at the break but ended up losing 30 – 17 in Narbonne. In their third game Georgia took a 17 – 8 lead into the break before Ireland got their act together but they eventually went down 24 – 20 in a match where they squandered five scoring chances in the last 10 minutes. This set up a play-off match against Scotland and again a flurry of tries in the second half by the Scots saw them go down 45 – 29 in perhaps their most disappointing game. Even in their win against Japan, a substantial first half lead was almost overturned as they shipped three second half tries, their blushes saved by a late effort from Tommy O’Brien. In all the games, except Georgia, the matches swung on periods where they conceded consecutive tries in a five minute burst from their opponents as the pattern from the Six Nations of periods of poor concentration were repeated. It’s a pity that the coaching team didn’t find a way to address this recurring problem as I still think that there was a good team there trying to get out. I’ve been wondering if the issue lies with the coaching or the players and I really don’t have an answer. I do think that the disbandment of the U20 Interprovincials does have something to do with it. The players are now transitioned into the club or A Team game where they can rely on the judgement of more experienced players for their game management and it was in thier game management where they were found most wanting. As I said earlier we have already done a Six Nations Wrap where we looked at the 33 players used during that tournament. On a provincial basis that squad was dominated by Leinster (52.0% game time) and Ulster (29.6% game time). Over the course of the World Championship the reliance on Leinster players increased to 62.0% of game time, largely at the expense of Ulster players which fell to 22.6% of game time. Nothing sinister here, the differences entirely covered by the withdrawal of Ulster’s Angus Curtis and Tom O’Toole due to injury! Combining the two tournaments we got a look at colossal 44 players this season, with 11 new names called up into the World Championship squad. The overall breakdown by Province as follows. Note: 40 minutes lost across the two tournaments due to Yellow Cards. From an Ulster perspective 11 players used across the two tournaments is probably an all time high at this level but it’s still a long way off the Leinster representation. The appearance and scoring stats for the players used over the 10 games are shown below. To me this was six to eight players too many to look at. In an ideal world I’d guess you would be wanting to look at your squad during the Six Nations and go into the World Championship with a defined starting side and replacements plus injury cover. Of course there were injuries between the tournaments but the coaching team never really settled on their best back line and, in fairness, with the exception of Michael Silvester and Angus Curtis in the centre, few of the backs stood up to make a position their own. Plenty put their names forward for a place in the starting side but few settled into a fixed position. Four Ulster players appear in the Top 15 of minutes played with Matthew Agnew the highest, recording 600 minutes out of a possible 800. James Hume features strongly despite being unavailable for the first 3 rounds of the Six Nations but he subsequently played in every match he was available for and clocked up 472 minutes overall. Matthew Dalton had a recurring shoulder injury during the World Championships and had a call up for Ulster during the Six Nations but he clocked up 407 minutes and Joe Dunleavy played in 6 of the seven games he was available for to record 356 minutes. Disappointingly FRU Favourite, Johnny Stewart, dropped out of the top 15 and was restricted to 351 minutes over the nine games he was available for, Leinster’s Hugh O’Sullivan winning the battle at scrum half more often than not. The hugely impressive Angus Curtis had his season curtailed after picking up a knock playing for Ulster and was unable to add to the 360 minutes picked up over the Six Nations as was the case with Tom O’Toole who was unable to improve on his 141 minutes. Somewhat surprisingly youngster Angus Kernoghan who featured in the Six Nations and subsequent U19 matches didn’t make the cut and remained on 181 minutes. The highly rated Aaron Hall and Michael Lowry both suffered with injuries throughout. Hall never really found his pre injury form clocking up 138 minutes as a back row replacement and Lowry made his only appearance in a delightful cameo in the final match of the World Championship with an impressive display at full back against Japan. Mark Keane, who impressed after a late call up to last season’s World Championship, was out of favour this year with only one 66 minute appearance in the Six Nations. Over the ten games Ireland U20 scored 274 points from 36 tries, 26 conversions and 14 penalties. An average of 3.6 tries per game is pretty impressive. Unfortunately they conceded 4.9 tries per game and, as I said, their defence was their main problem throughout the two competitions. Fifteen (42%) of the tries scored came from the forwards (including a penalty try) with the remaining 21 coming from the backs. Unsurprisingly out half Harry Byrne leads the points scoring with 20 conversions and 12 penalties to add to his two tries. Utility back Tommy O’Brien and No. 8 Jack O’Sullivan led the try scoring with 4 each. It’s a particularly impressive return form O’Sullivan and his absence from the World Championship due to injury was a big loss. Ulster’s Jonny Stewart chipped in with 3 tries with Matthew Agnew, James Hume, Matthew Dalton, Joe Dunleavy and Angus Curtis all picking up one each. I’m afraid that’s it for the combined stats as we don’t get much else on the Six Nations matches. However we do have additional stats, provided by World Rugby for the U20 Championship. These are stats that World Rugby supply and unfortunately there are only partial stats for meters made and none for turnovers which would probably have been more meaningful. Ulster’s Johnny Stewart and James Hume tops the clean break table in terms of clean breaks per 80 minutes played. There can be no denying that Dylan Tierney and Charlie Ryan made the most of limited game time by putting in the tackles when they came on 😯 however, the huge contribution by Caelan Doris is worthy of note with an average of 16 per game. Not only did Dorris make the most tackles for Ireland but he completed the most tackles across all the teams in the tournament. Ulster’s back row pairing of Joe Dunleavy and Matthew Agnew also contributed well with averages of 12.1 and 10.0 respectively. Jakub Wojkowicz managed to get in one carry support in his limited time on the pitch but top honours in this category go to Ulster’s Jonny Stewart with Leinster’s Tommy O’Brien and Jack Dunne also supporting well. Ulster’s Michael Lowry and Aaron Hall also make the Top Ten, albeit on limited game time. Caelan Dorris not only topped the offload charts for Ireland but this is the second set of stats where he set the standard for the tournament. Conor Dean chipped in well during his limited game time as did Sheehan, Cormac Daly and McCarty but the more regular starters contributed little in this aspect of play. I thought that Ireland underused this aspect of the game with a average of 8 off loads per game. However the key proponents, France, averaged 12 and the other finalists, England, averaged 10 so Ireland weren’t that far off. The stats are some help in deciding the Player of the Year but we are also fortunate that we have a raft of photographic galleries we can review for the majority of the games. From our review of the thousands of photos we took over the two tournaments there was one player who stood out with his ball carrying and support play on a continual basis. 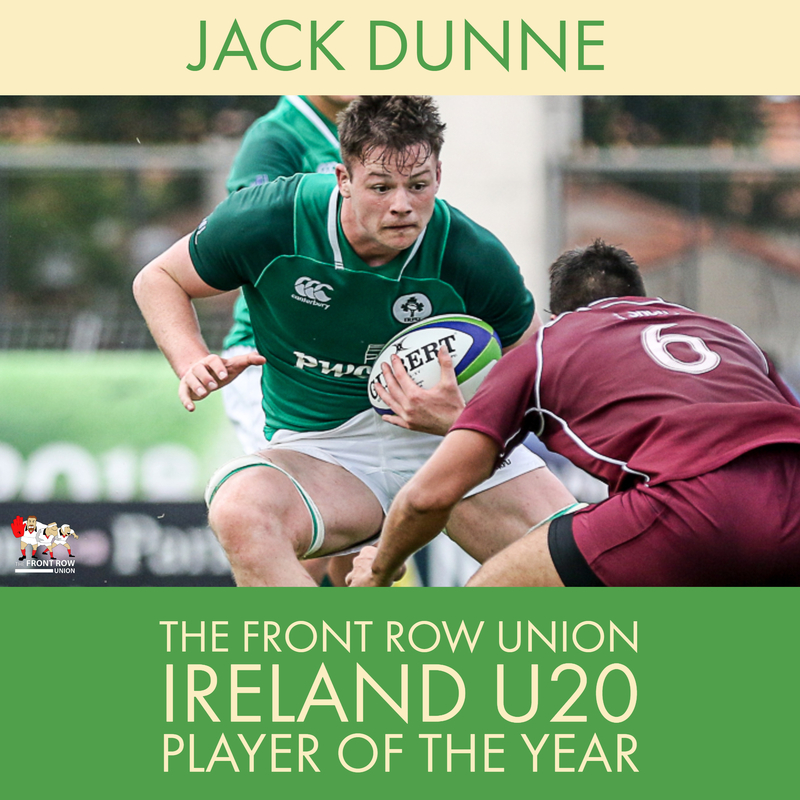 There were strong cases for Caelan Doris, Jack O’Sullivan, Angus Curtis, Michael Silvester and Matthew Agnew but the player that produced the goods over the two tournament and is The Front Row Union Ireland U20 Player of the season is the Leinster second row Jack Dunne who maintained a consistently high standard throughout.